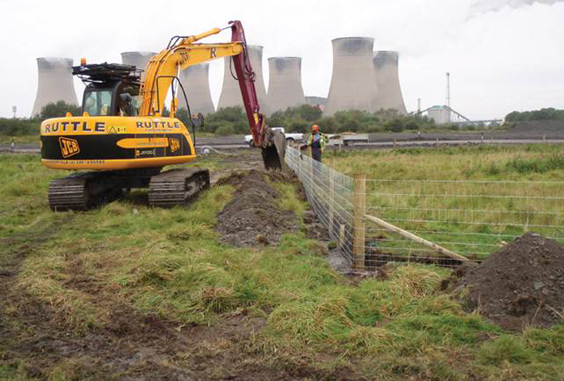 Ongoing habitat management works on North Lagoons at Cottam Power Station for EDF Energy . Works programme including invasive species control, scrub control, grassland management and Area 4 restoration area following up on planting and seeding maintenance works. Great crested newt fencing required to trap and translocate GCN from working National Grid working areas where the AGI is being up graded. 150 Great Crested Newts trapped and translocated to 3 new hibernacula in mitigation area. This summer Legacy Habitat Management completed a substantial project between Hardwick in Buckinghamshire and Marsh Gibbon in Oxfordshire. Over 49,000m of semi permanent newt fencing, along with 45+km of stock and demarcation fence, was laid for Laing O’Rourke Infrastructure PLC by our experienced team of 13 men. In spite of a number of logistical challenges that were identified in our survey, including the nationwide shortage of sawn timber and a relatively short lead in time, the project was completed well on time and within budget. 7000 pitfall traps allowed for the monitoring, capture and translocation of Great Crested Newts, a species protected under both UK and European law as well as other amphibians and reptiles native to the site. The entire fence will be removed from the construction site this month and the fencing materials will either be reused or recycled within the course of other wildlife mitigation projects. “Laing O’Rourke Infrastructure had been commissioned to install 21km of gas pipeline across the Buckinghamshire and Oxfordshire country side. To protect the high local newt population, Legacy Habitat Management were contracted to install newt fencing for the entire pipeline corridor. Legacy demonstrated a high level of workmanship and flexibility throughout the project. The quality of the fencing material has meant that minimal repairs have been necessary, even with a moderate level of abuse. The overall professional approach and friendly manner of Legacy impressed us all and we will have no doubts about offering them further work.” Greig Higham, Environmental Manager, Laing O’Rouke Infrastructure. The former Silverdale Colliery site has been acquired by the Telford based National Regeneration Agency English Partnerships. The site has been acquired for redevelopment into a mixed use residential and recreational area. As part of the regeneration scheme two large pools are being developed, one as a recreation area and the other as a wildlife sanctuary. As part of the mitigation strategy to avoid unfavourable impact on any Great Crested Newts that might inhabit the site, six receptor ponds have been constructed to be used as holding ponds while restoration work is in progress. A containment fence has been erected around the six ponds to prevent the movement of relocated newts and an exclusion fence with traps has been erected around the two pools to exclude and capture newts. Additional drift fencing with traps has also been erected within the old colliery Void and Pithead sites to assist the survey and capture of migrating newts. In all Legacy Habitat Management have erected 5,000m of Newt Fencing, set 750 pitfall traps and cleared a hectare of scrub vegetation - all on time and on budget. An effective solution for pond creation Legacy have been working with Kirklees Council to create a new recreational amenity and wildlife resource at Dogley Nr Huddersfield. The naturally fed ‘Big Pond’ is on the site of a long disused sewage works just off the A629 in Dogley. Legacy excavated an area of approximately 2500m square to provide a natural supply to open water with a soak away adjacent to the river Colne at Thunder Bridge Dyke between Woodsome Hall Lane, Woodsome Lees Lane and Dogley Lane. Because of the nature of the site (which had largely been backfilled with brick rubble from the extant buildings and was not suitable for producing a natural pond) Legacy used Bentomat clay liner to hold the standing water. At the top end of the site a ditch was running into the site but the water was disappearing underground through pipes or rubble backfill. Legacy came up with the solution of lining a ditch channel with the Bentomat in order to create a stream feed. Kirklees Council (in partnership with the Environmental Alliance) are doing a wonderful job in this area creating a ‘Green Network’ of interlinked green spaces surrounding the river corridor. This work will have a very positive effect on the biodiversity of the area and will also bring the proven social benefits of access to green spaces. Legacy have recently installed over 3,000m of permanent exclusion barrier to protect populations of Great Crested Newts on the site of a spectacular old iron ore works belonging to Corus near Scunthorpe, Lincolnshire. 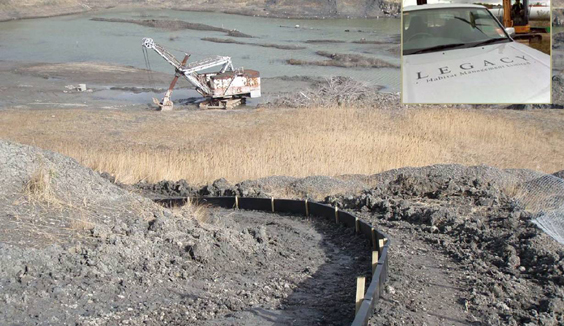 Work was undertaken under challenging conditions whilst areas of the quarrying operations were prepared for land fill. Solutions have been provided for ditch and stream crossings whilst our staff had to operate safely on steep and sometimes unconsolidated ground. Pitfall traps and refugia are incorporated into the design in order to safely and effectively translocate the Great Crested Newt population. Working for Nissan Sunderland, Legacy have installed 3,000m of Newt Fencing over two phases to accommodate 4 new wind turbines in addition to the existing 4. When completed the turbines will have the potential to provide 10 per cent of the manufacturing facility electricity requirement. Nissan bought second hand turbines from Germany to keep the capital costs down and they expect that this will to allow payback within three years. In collaboration with Durham Wildlife Services Consulting, Legacy have also provided 0.5 hectare of woodland clearance around turbine 8 to safeguard the resident bat population which might otherwise feed in close proximity to the turbines. Cottam Power station is one of the many power stations on the river Trent in Nottinghamshire. Like most coal fired power stations Cottam uses an on-site landfill for disposal of the ash from the boilers. The owners, EDF energy, have been granted planning permission to raise the maximum height of the landfill. This involves further tipping on previously closed sections of the landfill site. A number of badger setts were identified within the boundaries of this reopened tipping area. EDF were granted a licence to close the setts. Given that the setts had numerous active and abandoned entrances and due to the fact that the ash substrate provided good digging conditions, it was thought that gating each entrance was not a viable solution. Instead whole setts were enclosed by Badger fencing. Badger gates were installed along obvious access lines. This ensured that the closure programme could progress without delay and overall costs, when time was factored, in were minimised. To reduce costs and given that the fence only needed to be temporary in nature, the fence was installed in the manner of a post and wire stock fence, with of course the addition of a buried underground return, rather than the standard post and rail specification favoured on sites where longevity is a key.